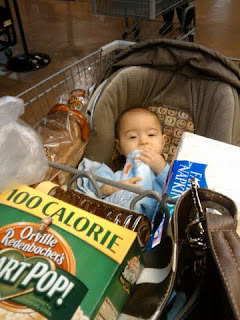 With two babies, you have to be creative in how you shop, if you are going to dare attempt it on your own ;) I think I have tried just about every way you can imagine to take both babies shopping. I just had to snap pictures of these funny moments. When I see moms with three (or more) kids, with some/all of them mobile, I just watch and wonder how they do it!! My sweet boys sitting up on their own this morning! Matthew on left, Adam on right. Are completely captivated by people and their surroundings. Even if they are nursing & dad comes into the room, they both immediately look at him & smile. No words yet, but hopefully soon! Take 2-3 naps a day. Naps are starting to become longer & further apart. Usually sleep from about 7/8pm - 6/7am, waking up only once to nurse. They are starting to develop their own personalities. More sensitive. Loud noises or people making strange faces can make him cry. Sticks his fingers in my mouth while he nurses. I am so happy I made it to 6 months. So far, every month has gotten easier & more fun. I do still feel overwhelmed at times. And, I admit, I can feel jealous of my friends who have singleton babies. I am jealous they can hold their baby on his own, that they are much more mobile (stick him in a moby wrap and you're good to go), that they can breastfeed one baby at a time (easier to cuddle & bond, and easier to travel). They looked so peaceful together, it made my heart happy :) I really really love that they have each other, that they have a built in playmate, that they share a room (so I worry less about them being lonely at night), and that they will (hopefully) be friends for life. Today, just 8 days shy of their 6 month birthday, Adam & Matthew had their first solid food (whole grain rice cereal). They loved it! I will admit, my goal was to exclusively breastfeed for a full 6 months. 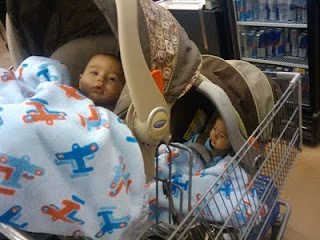 But, the boys were consistenty acting hungry after nursing. I felt I should either give formula or solid food, so rice cereal it was. They couldn't get the food fast enough, it was so funny!